Whenever I’m getting ready to go to or from work, I always have a notion that if I leave by a certain time, my drive will be smoother due to less traffic. Of course, even if I leave at the same time every day, my drive time is still going to vary. When Google Maps recently provided the feature to give an estimated travel time range for a future trip, I decided to see if I could find anything interesting about my daily commute. This also seemed like a perfect opportunity to try out the new space filling design features in JMP 12. 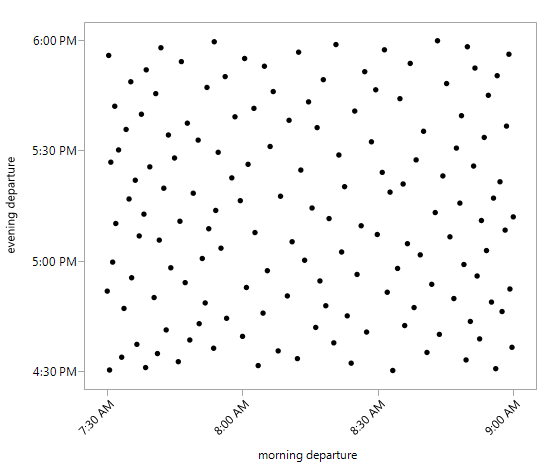 While I don’t know all of the details of how the time is estimated, I can treat the response as coming from a computer simulator with a deterministic response: If I put in the same departure time/day over and over, I keep getting the same expected time. So, it’s a waste of resources to use replicate runs. I collected the data all in one sitting, since it’s unclear to me how/when Google Maps updates these estimates. 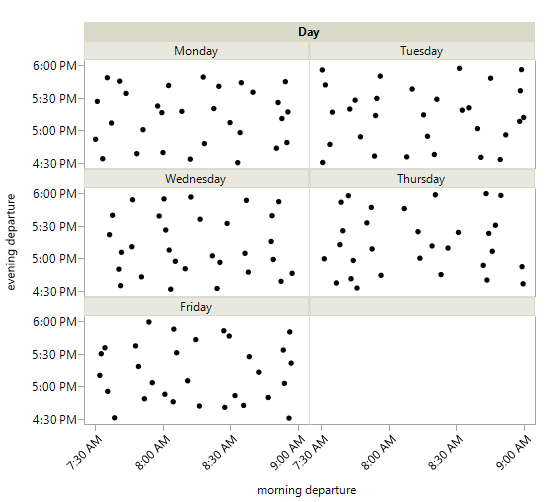 To demonstrate the utility of the space filling design, let’s assume that all I have available to me is the total travel time based on the time I leave in the morning and the time that I leave work in the evening (i.e., I don’t have the individual morning/evening trip times available). I then want a design that has a good mix of morning and evening departure times, ideally over different weekdays. 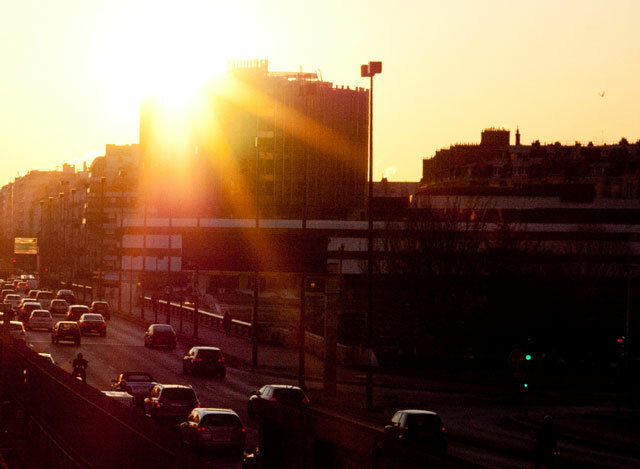 My morning departure can occur between 7:30 a.m. and 9:00 a.m., while the evening departure is between 4:30 p.m. and 6:00 p.m. For simplicity, I let the time variables range from 0 to 90, representing the number of minutes from the start of the range. Suppose I only have the resources to collect data from 150 points. Why even use a space filling design, when I could just spread out the points over evenly spaced intervals? Since I can specify departure times in increments of whole minutes, to collect data over the whole range would require 91 x 91 x 5 = 41,405 points. Even using 10 minute increments, I would need 11 x 11 x 5 = 605 points, and I lose any chance of observing if travel times change in between the 10 minute intervals. I also want to make sure that I don’t use the same times on each day, because if there are no differences between days, I would be collecting the same results each time. The observant reader may notice the scale on the axes is no longer from 0-90. This is a matter of changing the Column Info and is best left for another blog post if there’s any interest (just leave me a comment to let me know). Now that we’ve created a design, it is time to collect some data. My next blog post will show the analysis to see if anything interesting results.